The Experts Agree | Let's Swap! Let’s Swap — a new project from Brooklyn-based hyperakt — is an awesome site that enables artists to swap their art for the featured print. 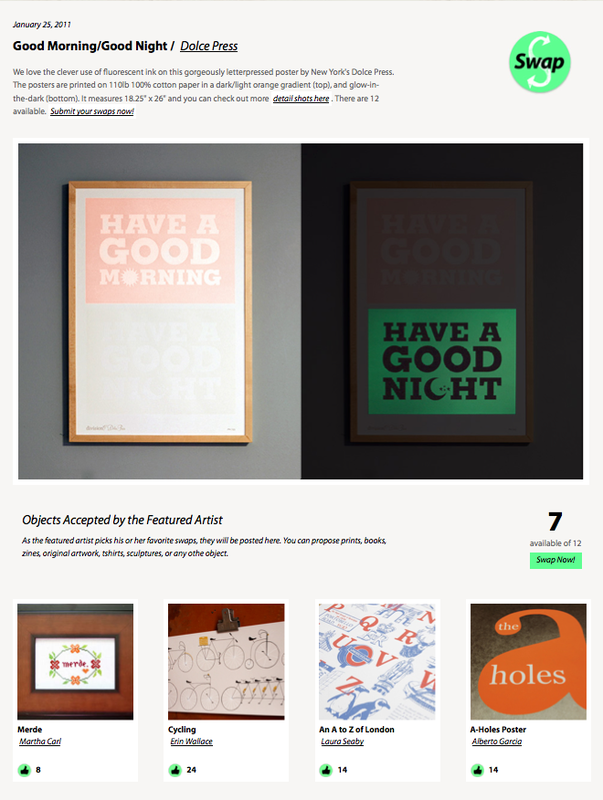 The print that is currently available is the Good Morning/Good Night from Dolce Press. It is full of awesomeness — letterpress, glow in the dark and an upbeat message. If you’ve got something to trade, go submit your swap and see if you get chosen, otherwise the print can be purchased from Dolce Press’s shop. UPDATE: Our CMYHey Triangle print was chosen by Dolce Press as a swap. You can go vote for us to put us in the running to maybe be a featured swap in the future! 3 comments to Let’s Swap! what a great print and what a great blog! We love the letsswap.it concept! Hope you guys enjoy the poster, we just got the CMYHey print and its pretty cool. Thanks again for helping keep the swap going! Awesome, I’m so glad the print arrived safely. Can’t wait to see the Good Morning/Good Night print in person.